ELECTRIC LONG HANDLE POWER TRIM; COMMAND THRUSTDelivers more low-end torque for excellent acceleration, even when pushing a heavy load. Great for aluminum tiller, aluminum console, fish & ski boats and pontoons. 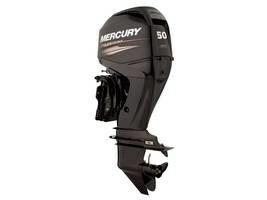 2016 Mercury Marine FourStroke 50 hp Command Thurst Held to a Higher Standard Enhanced fuel injection for boosted efficiency The most popular outboards on the water because they deliver what every boater wants – no-worry reliability and outstanding performance.